The recent 72nd Singapore Open Track & Field Championship saw the field event having the most improved results with four addition to the Singapore-leading list. None however was from the track side. Our retired discus legend James Wong overtook the old leading of 46.66m by Scott Wong; no relation of course; with a new effort of 49.07m. James still hold the national mark of 59.87m. James Wong in the blue shirt seen here during the prize ceremony at the recently concluded Singapore Open. The other three leading affirms the young hotshots of their respective field events in Singapore. Scott Wong improves his season best with a 14.67m effort in the men’s shot put. He improved by whopping 46 centimeters smashing his old effort of 14.21m set in June. 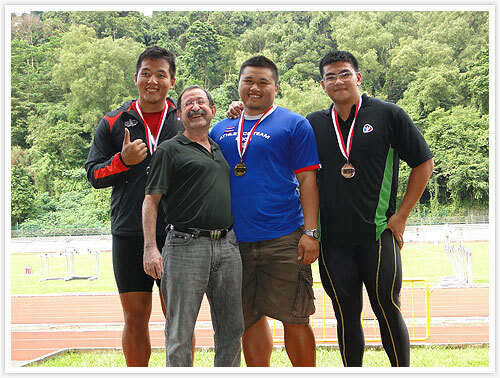 Dong Enxin holds the shot put national record at 17.44m. Scott Wong seen here on the far right, he finished third at the Singapore Open. Wing’s Teo Hui Juen is the top Republic women’s javelin thrower, although her javelin throw of 38.56m was enough to earn the Singapore-leading effort, it was a far-cry from the national mark of 51.66m held by Zhang Guirong. Teo Hui Juen is still a raw talent with a lot of potential. 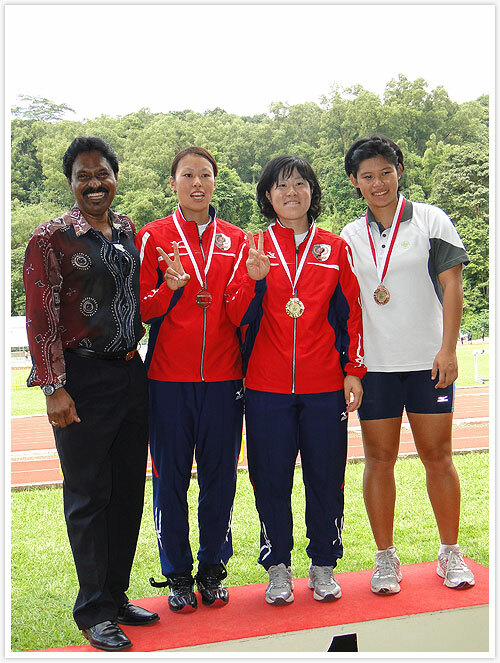 Teo Hui Juen on the far right at the Singapore Open, who won a bronze medal with her 38.56m javelin effort. Lastly national thrower Wan Lay Chi also improved her season best in the women’s discus. Familiar home-ground, and local support spurred her to better her old leading mark of 43.78m set in Bangalore, India, to a new Singapore-leading of 46.78m. The women’s discus national record is held by Zhang Guirong at 49.91m. Well done to all the athletes! * Red color means latest leading update. Credit: With assistance from Heinrich Hubbeling, Statistician for IAAF and ASIAN AA.